This is a watercolor painting demonstration based on a photograph my wife took when she was sailing out of San Diego Harbor on her way to Mexico a few years ago. Boats and mist are subjects just made for watercolor (watercolour). It is an ideal medium for paintings with lots of soft light passages and a small amount of detail. As you can see there is very little detail in this painting other than a the silhouette of the various boat shapes due to the nature of viewing an object into the light within mist. My main aim is to capture the atmosphere in this scene which will hopefully strike a chord in others who have experienced mist rising over the water early in the morning. Note how soft the little boat on the left looks. It is very important for adding the feeling of mist to the scene. 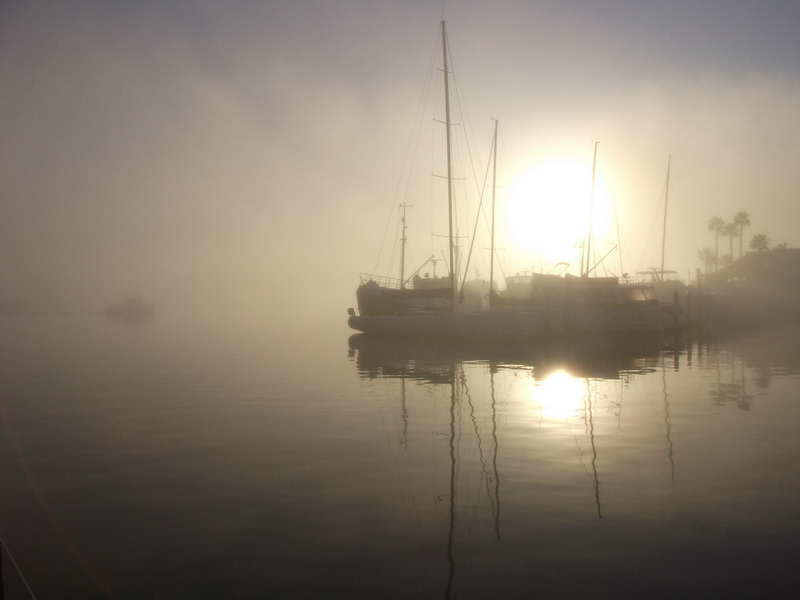 The light silhouette of the trees and buildings on the right as well as some of the more distant boats also contribute to this feeling of mist and space. The soft wet on wet watercolor washes contrast well with the small amount of hard edged wet on dry detail. Paper: Quarter sheet (37cm x 27cm) of Arches 300gsm Cold Pressed watercolor paper. Brushes: Watercolor round brushes sizes 24, 16, 12, 8; all with a good point when wet. Colors: Winsor and Newton artists watercolor paints; Cobalt Blue, French Ultramarine, Cad Orange, Burnt Sienna, Alizarin Crimson, and Cad Red. Misc: Fine mist spray bottle. I lowered the horizon line from that in the photo as it was too close to the middle of the page. In the drawing for this watercolor painting I concentrated on the height and spacing of the masts and made sure the main sail boat in the foreground was reasonably believable as a boat. For the rest of the items in this scene I was more interested in the light and dark shapes that would appear within the painting and how they would aid the feeling of depth and mist I was after. The two little boats on the left hand side are important as they will be painted very softly to enhance the misty feel of the scene and also help balance the painting. I used a plastic circle template to draw in the shape of the sun rising above the boats as well as its reflection in the water. Notice I did not draw in any of the main reflections; these would be done after the rest of the painting is completed and will be used to connect the boats and other objects to the water. Before moving on to the initial under painting stage I erased any sharp lines, especially around the sun shapes, that I did not want to appear in the final painting (Figure 3). 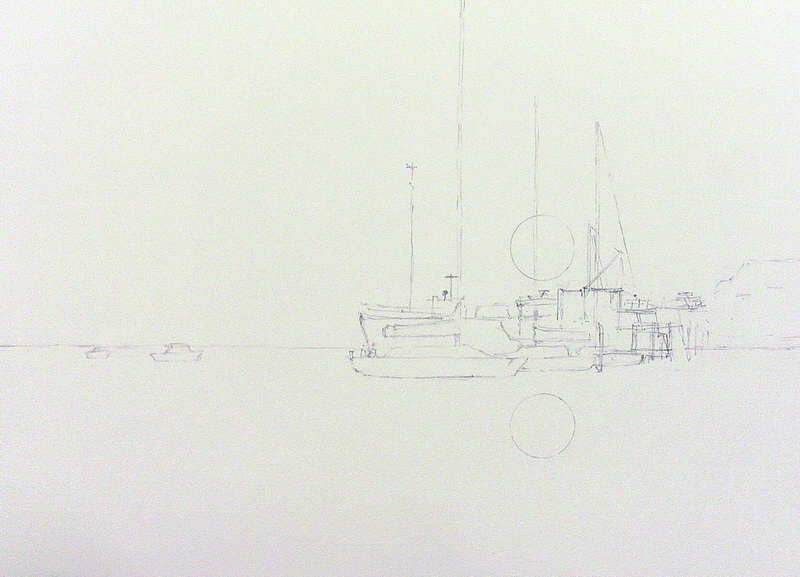 Figure 3: Before starting to paint you watercolor erase most of the lines around the sun shapes so they will not stand out later in the finished painting. 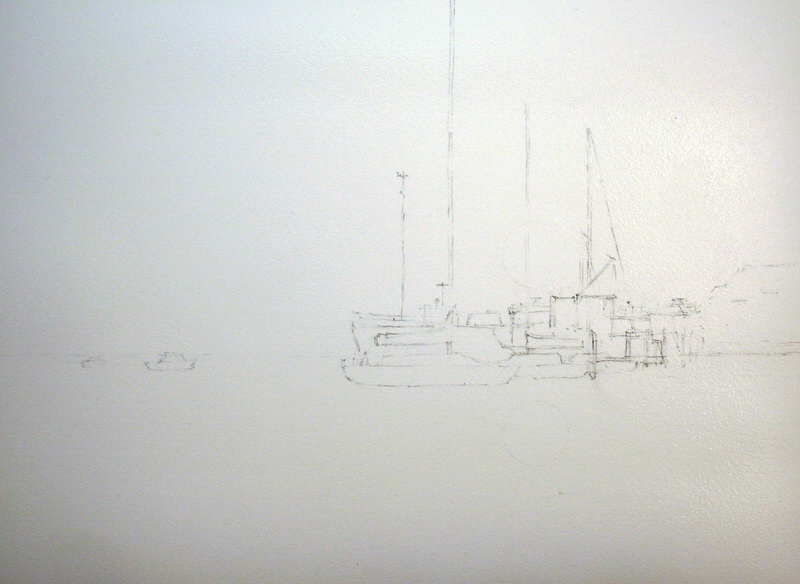 We are now ready to continue to the next stage of our watercolor painting of boats and mist.